The rickshaw creaked painfully along a hazy ribbon of grey. Images of snowy peaks melted into pools of sweat as we braved the hot winds sweeping across Nepal’s southwestern terai. It seemed cruel to subject a fellow human being to such physical strain and worse to deny his right to earn a living. Racked by these twin conflicts we shifted uneasily, more from guilt than the discomfort of our seat. Riddled with inner conflict, we chose to traverse the Middle Path on our Buddhist Circuit Tour at Lumbini. In a land where the Eyes of the Buddha follow you everywhere, we were fortunate to be at the place of his birth on Buddha Jayanti. Was it mere coincidence? We imagined how it must have been in 623 BC when Maya Devi, a queen of the Shakya clan, journeyed from Kapilavastu to her maternal home in Devdaha. Admiring the beauty of the region around Lumbini, she stopped to rest in a grove of sal trees, when she was struck by sudden labour pangs. It is said that Maya Devi clutched a drooping branch of a sal tree as she gave birth to Siddhartha, the future Buddha. She took a dip in the Pushkarni or sacred tank and gave the newborn his first bath. A sudden clang of gongs brought us back to the present. A procession of ochre-robed monks walked past the tank towards the Maya Devi temple. Enshrined amidst the brick ruins of an older structure, was a moss-covered slab of stone. Excavated as recently as 1996, this was no ordinary stone, for it marked the exact spot of Lord Buddha’s birth. We followed the monks as they paid homage to the marker stone and the unusual Nativity Sculpture, a bas relief depicting Maya Devi and the birth of Buddha. A drone of chants drew us outside to the Ashoka Pillar, where a sizeable crowd had gathered. Various tongues blended into one voice of devotion as Buddhist pilgrims from all over the world bowed their heads in prayer. The tall cylindrical column stood within a metal fence and the faint scrawl was barely discernible. Erected by Emperor Ashoka in 249 B.C. to mark his visit, the Pali inscription in Brahmi script is believed to be the first epigraphic evidence related to the life of Buddha. Besides confirming the spot as Buddha’s birthplace, it also records the economic impact of Ashoka’s visit – Lumbini’s tax liability was reduced to one eighth! Meandering past the ruins of stupas in the sprawling Sacred Garden, we came to the Eternal Peace Flame and World Peace Bell overlooking a canal. As part of a global initiative to promote Lumbini as a centre for world peace, different countries and Buddhist sects had constructed a fascinating array of temples, monasteries and stupas. Myanmar, China, Thailand, Vietnam, Sri Lanka, Japan, Mongolia – the International Monastic Zone was virtually the United Nations of Buddhism. Ironically, it was the German Monastery (Great Drigung Kagyud Lotus Stupa) that was most riveting. From an ornamental alcove in the stupa, Buddha gazed down over the pagoda-style roof in benevolence. A flight of steps led to the main shrine where every inch of wall space was awash with lavish paintings. Four gigantic prayer wheels set in uniquely designed pavilions marked the corners of the surrounding garden and gilded statues depicted landmark events from Buddha’s life. A quaint bridge led us to the gateway of the Vietnamese Phat Quoc Tu temple with its delicate lacy architectural embellishments. The conical spire of the Myanmar monastery pierced the blue sky like a golden dagger. Massive Confucian deities at the entrance and a beautiful Buddha statue formed the main highlights of the Chinese Zhong Hua temple. Each monument had a different interpretation of Buddhist ideology in architecture and style. To the north of the monastic complex was the Lumbini Museum, a treasure trove of ancient relics like Mauryan Kushan coins, sacred manuscripts and sculptures. The Lumbini International Research Institute nearby had a phenomenal collection of over 12,000 books and periodicals on religion, philosophy and art. Just across the road stood the Japanese World Peace Pagoda. Moved by a tragic sense of loss after the atomic explosions at Hiroshima and Nagasaki, Ven. Nichidatsu Fujii, founder of the Nipponzan Myohoji Buddhist order, erected peace pagodas across the world. Built according to the tenets of the Lotus sutra to disseminate love and peace, the foundation stone and pinnacle of the pagoda enshrine Lord Buddha’s relics. The gold-plated bronze of Nepal’s tallest Buddha statue in the niche gleamed in the sun as visitors rested on the cool marble floor in the shadow of the giant dome. In the distance we spotted a fox slinking across the plains as nilgai grazed unafraid in an open patch. The harsh dry season was not the right time to visit the adjacent IUCN Wetland Park where Sarus cranes and other wetland birds abound. So we continued on our Buddhist trail to Kapilavastu, the ancient capital of the Shakya king Shuddhodhana, Lord Buddha’s father. It was here that Buddha spent the first 29 years of his princely life before renouncing the material world. He left his father’s palace from the eastern gateway, the ‘Mahabhinishkramana Dwara’, tied his horse to a tree and left on his quest for truth. Excavations at Kapilavastu (present-day Tilaurakot) have unearthed the ruins of the palace complex encircled by a 22 feet wide moat and 10 feet wide defense walls with gateways on the east and west. Our next stop was Kudan, the ancient site of Nigrodharma (Banyan Grove) where king Shudhodhana built a monastery to welcome his son when he returned as the Enlightened One and Prajapati, his mother’s sister presented a Kashaya Vastra to him. In later years, Buddha’s son Rahula entered into monkhood here. But all that remained were a few brick mounds bearing floral carvings. For a Buddhophile, there are many places worthy of exploration. Spread over a 12 km radius around the town of Taulihawa, you find several historic sites – Aurorakot (the natal town of Kanakmuni Buddha), Niglihawa (site of a tank and Ashoka Pillar), Sagarhawa (an ancient pond where Shakyas were massacred), Gotihawa (stupa and Ashoka Pillar) and Ramagrama (10 m high brick stupa), besides other archeological ruins. Free from his responsibilities after the Buddha Jayanti festivities, Jeevnath Pandey of Kapilavastu Nagar Palika, accompanied us on some of our forays. When asked if India’s claim of Piprahwa in UP as the original Kapilavastu was true, he chuckled. ‘India has three major sites; we have only one! Though Lumbini was Buddha’s janm-bhoomi (place of birth), his karm-bhoomi (place of duty) was India! Sarnath, Bodhgaya and dozens of other sites in India enjoy the spotlight, but Kapilavastu, overshadowed by Lumbini, lies forgotten. Yet, you want more?’ No we didn’t. It was time to go. 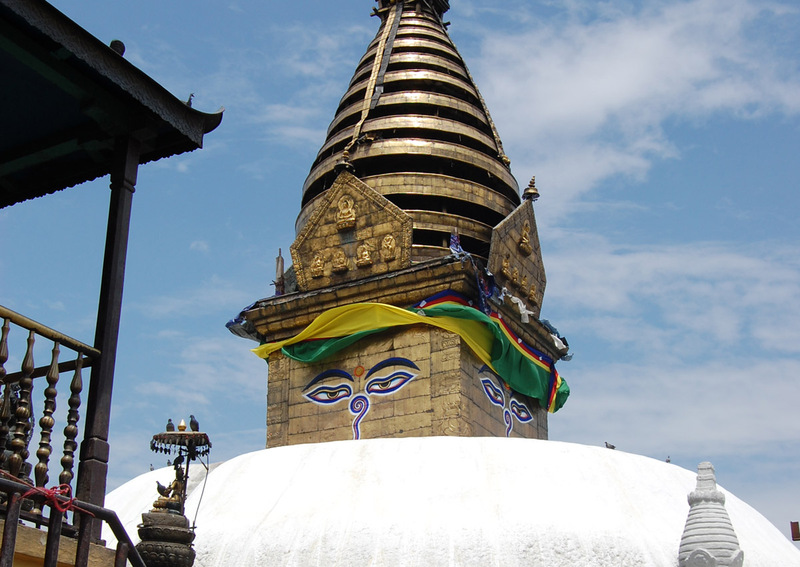 Complete the Buddhist Circuit in Nepal by visiting famous stupas like Swayambhunath and Bouddhanath, a UNESCO World Heritage site. Besides Lumbini, the other three major sites related to the Buddha include Bodh Gaya (where he attained enlightenment), Sarnath (where he held his first public discourse) and Kushinagar (where he attained Maha-parinirvana). Subsidiary sites include Rajgir (where Buddha meditated for months and venue of the First Buddhist Council), Kaushambi (where he delivered many sermons), Shravasti (his favourite monsoon resort) and Vaishali (where he gave his last sermon and the Second Buddhist Council was held). Jet Airways operates regular flights from Delhi and Calcutta to Kathmandu. Local carriers like Buddha Air and Yeti Air run direct flights (30-45 min) to Bhairahawa (Siddhartha Nagar), 22 km from Lumbini. Located very close to the Indian border, Lumbini is just 27 km from Sunauli in Uttar Pradesh. Buddha Jayanti or Buddha Purnima, celebrated in May, is an auspicious time to visit Lumbini, provided you can withstand the peak summer of the terai region. November to March offer more pleasant climes. Authors: Anurag Mallick & Priya Ganapathy. This article appeared in the April, 2011 issue of JetWings magazine.